Daniel Hope is one of the greatest violinists of our age: an internationally-celebrated star, who performs on the greatest concert stages from Beijing through London to New York, and who is part of the avant-garde of a new, young generation of classical musicians. His biography is a story of an extraordinary career, a story of escape, expulsion and desire for self-discovery. Hope was born in South Africa in 1973. His mother is the daughter of German emigrants with Jewish roots, who fled from the Nazi regime at the last minute and tried to make a new home for themselves in South Africa. He is of Irish descent on his father’s side. As a child, Hope experienced the apartheid first-hand. His father was a critical intellectual publisher, who also published black authors, and ultimately had to emigrate with his family from South Africa to England in order to escape from the political backlash. When Daniel Hope, then aged just four years old, met the world-famous violinist (and his own future mentor) Yehudi Menuhin in London and the rest of his life was suddenly determined: he wanted to become a violinist. The tension field between professional and personal new beginnings in 2016 made Daniel Hope think about the question of what the drive of his work, his creations and his actions is. 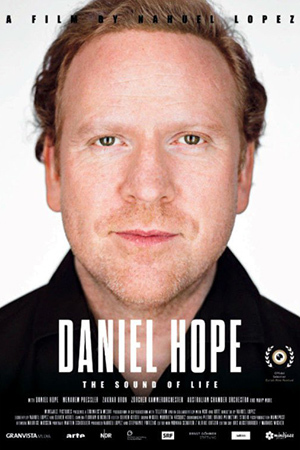 Against the backdrop of the 100th birthday of Yehudi Menuhin, his great mentor and fatherly friend, Daniel Hope sets off to an autobiographic voyage of discovery. A journey to his own roots. But also a journey to the world of exile. The documentary HOPE tells the story of his life, reflects present and past, and questions the compulsion and restlessness of such an international career.